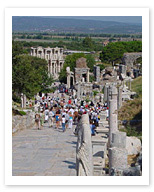 After the Sultanahmet area in Istanbul, the ruins of Ephesus (Efes) are the most-visited touristic site in all of Turkey. It is also one of the best-preserved classical cities in all the world, on par with Rome and Athens in scope, quality and feel. St Paul, St. John, and the Virgin Mary have all been placed in this, the “first and greatest metropolis of Asia”, as well as a host of other characters, including rich old Croesus, General Lysimachus and the Emperor Hadrian. In ancient times Ephesus was the center of the cult of Cybele, the fertility goddess who later became Diana (Artemis in Greek). The city was also a Roman provincial capital and home to one of the Seven Wonders of the Ancient World, the Temple of Diana, whose massive foundation can still be seen today after nearly 3 millennia. St. Paul lived here for 3 years in the 60’s (that is, 0060’s AD), when the city is supposed to have had a population of nearly 250,000, and here wrote one of his most famous epistles as a letter to the Ephesians. The ruins of Ephesus are vast and extraordinary, and you can take up the larger part of a day to see them. Among the most impressive are the Great Theatre, capacity 25,000, a marvellous library facade, still standing, which once held 12,000 scrolls, beautiful statues, mosaics and frescoes, and any number of structures sprawled across the ancient city. For those who like to take a step back into time, there are few places in the world better to do so.